When it comes to video slots, these are exciting and fun and the manufacturers are putting in a lot of effort to make them even more entertaining. Another nice addition to video slots is the addition of pay lines together with the amount of coins that a player can bet on each line in order to augment the bet on every spin. The main reason behind this is that, video slots with elaborate screens take more time for every spin contrary to the regular reel type machines. 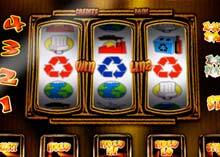 Players do not put money in the slot machine, when bonus round is played or when the video reels spins. Whereas the reel type slot machines take in three coins and spin very rapidly. So to get back some of the profit, which the slot machine is not producing during the regular play/spin process, players are tempted to bet extra coins on each spin. Majority of the latest slot machines have the standard of five coins for every line, so the maximum number coins that a player can bet is 45. For the maximum bet, the amount would be $11.25 for quarter slot machines and 2.25 dollar for nickel slot machines. In case, you wish to play just one coin on each one of the lines, then it would come to $2.25 for quarter machines and 45 cents for nickel machines. As compared to a regular reel machine, you have to shell out extra money to play on video slots. When choosing a slot machine, you should always consider that most of the slot machines pay big jackpots only when you play maximum coins. It can be three or four coins on reel type machines. Comparatively, on video slots the maximum number of coin can be either 45 or 90 coins. It is not always necessary that jackpots on video slot machines fall in dollar amount that can change a life, like a Mega-Bucks game or any other progressive slots. Therefore, instead of betting maximum coins you can play just one coin on each line. When you are aware that your odds of hitting the jackpot is less, you should try to get maximum entertainment by playing one coin on each line and extending your bankroll. It is up to you to decide, whether you would like to play reel type or video slots, with maximum coins or just one coin. Just keep in mind that playing lots should be taken as entertainment. It is good if you get lucky and hit the jackpot, but you should never play with extra money if you cannot afford to lose.